Kidneys are vital organs of the body and contain millions of tiny filters (Nephrons), which remove waste products from the blood. Diabetes causes break down of this filtering system, resulting in accumulation of waste products in blood (Urea & Creatinine). 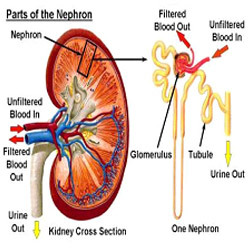 Initially the defect in kidneys is small (Stage of microalbuminuria i.e. < 300 mg/day), and ultimately both the kidneys fail (Chronic Kidney Disease- CKD / End Stage Renal Disease- ESRD) and the patients need to have either Dialysis or Kidney Transplant. 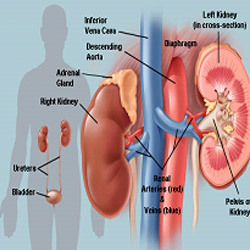 How to prevent Kidney Disease ? Have a good control on your Blood glucose. Consume Less proteins (0.5 to 0.8 gm/kg bwt/day) if your blood urea is high. Certain medicines (esp. ACE inhibitors/ARBs) can prevent or slow down the progression of Kidney diseases, thus always consult your doctor regarding their use. 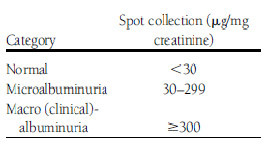 Microalbuminuria is the presence of albumin (protein) in urine. It signifies the earliest stage of kidney problem (Nephropathy) in a diabetic patient. It can be totally reversed to normal by achieving good glycemic control & controlling high BP at this stage. All diabetic patients should be screened for microalbuminuria at the time of diagnosis of diabetes and if test is found negative then every year (in Type1 diabetes after 5 yrs of diagnosis & then yearly). What are the RISK FACTORS for Diabetic Kidney Disease? What are the Stages of Diabetic Kidney Disease? There are 5 stages of Kidney Damage. To simplify this we can say "Early" and "Late" Kidney Damage. In the 'Early stage' of kidney damage, traces of protein (Albumin) begin to appear in the urine. This is also called stage of MICROALBUMINURIA, it has no symptoms and can be treated with diet & medicines (ACE inhibitors & ARBs). This stage is Reversible if managed properly. In the 'Late stages' (CKD) of kidney damage, large amount (stage of Macroalbuminuria/Overt Proteinuria) of proteins are passed in the urine. In this stage patient can have symptoms of passing less urine. This stage is usually Irreversible, but further progression can be prevented / slowed down with proper treatment. Finally the stage of Chronic Renal Failure (CRF) sets in, which can rapidly progress to End Stage Renal Disease (ESRD) which requires either Dialysis (Hemo / Peritoneal) or Kidney Transplantation to sustain life. What are Tests (INVESTIGATIONS) required in Diabetic Kidney Disease? Urine Routine & Microscopy Test (Urine Culture/sensitivity if pus cells are present). ACT NOW & SAVE YOUR KIDNEYS!